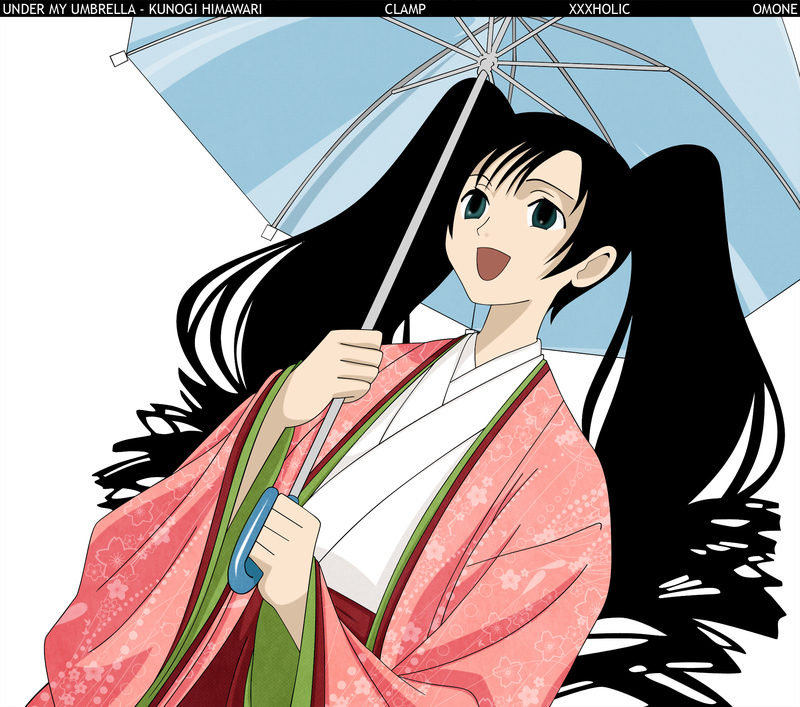 This is already my third Vector of my xxxHOLiC Vector Series. I can't believe it. I changed the number from 5 up to 10 because I found so many beautiful Images from this series. Most of them are from the game and have bad quality. I don't know if I have enough patience to vector these, but they are looking so beautiful. I really would like to play this game but in my opinion there will never be a release of this Game in Germany. Too bad. The scan I used for this Vector is also from the game and had poor quality. I got insane. When I enlarged this image the lines became so blurry and you could'nt see them really so I had to use my imaginition. Too bad I did not anything like this =D In the original scan Himawari hold something like a rope in her hand or something like this. It looks really strange so I vector an umbrella for her. First I vector my own umbrella but after some while I searched for a scan with an umbrella. I did not know why I didn't used a scan immediately. I also had problem to find the right colors. In the end I used a pink instead of orange. Nyaa the all the colors were quite intense..
Wow, you're pretty fast! Nice job on this vector! Giving her an umbrella was a great idea! (And now you've got "Umbrella" by Rihanna stuck in my head :P). I especially like the patterns on her kimono, they look really good! The only thing I can say is that some of the outlines look a bit jagged on the edges. Sometimes blurring them a little can help that. Otherwise nicely done, keep it up! wah *_* you really onto the xxxholic ne ^^"
nice.i love the pattern that you used on her kimono. but i have to agree with ash-chan , some of the outline looks jaggy. and the eye is a lil bit weird. Though the hair looks a bit strange it's still beautiful! There's something up with her eyes. But the pattern on her kimono is amazing. Nicely done! Anyhow, she's fine, although her left hand and eyes look a bit weird, but nevermind that, it's really good. Haha, nice girl, like it very much,nicely done!